Wei-Yang Andy Lin, born in Taiwan, recognized as one of the most promising young violists and erhuists of today. He is the artistic director and founder of the New Asia Chamber Music Society. He came to the U.S. in 1997 to attend the Idyllwild Arts Academy and holds his bachelor and master’s degrees from The Juilliard School. 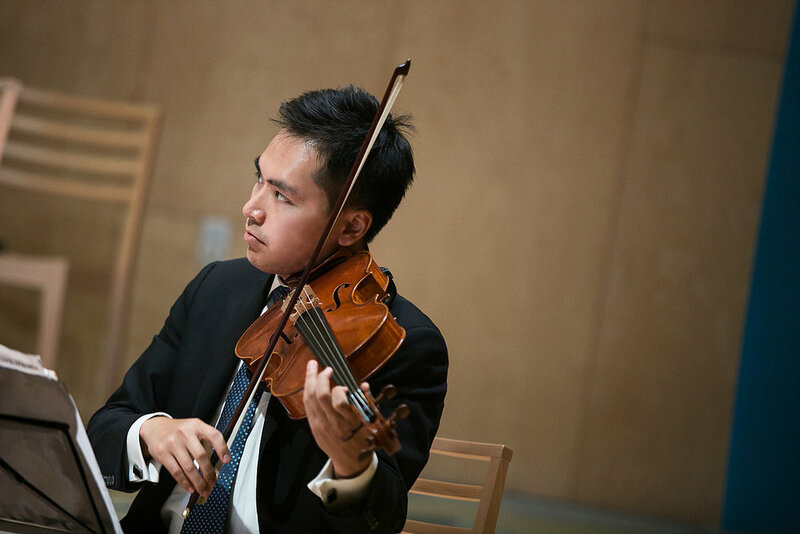 Mr. Lin has won numerous competitions including Taiwan National Viola Competition, the Idyllwild Concerto Competition, First Prize in the 2008 Juilliard Viola Concerto Competition and subsequently made his Avery Fisher Hall solo debut with the Juilliard Orchestra. He was also the winner of the 2009 Stony Brook University Concerto Competition. In January 2013, he appeared as soloist on both the viola and erhu with the Yonkers Philharmonic Orchestra. He has also appeared as soloist with the Incheon Philharmonic in Korea. In addition to his accomplishments as a classical musician, he is also a world recognized professional erhu player. He has recently gave his erhu Lincoln Center debut at the Alice Tully Hall playing an erhu concerto “Newlywed’s Departure” with the COS Young Symphonic Ensemble. He has recorded film music for a number of movies and short films, including “The Blood Brothers” and the award winning short film “Daughters” (Best Original Score at NYU Tisch Film Festival). He has performed the erhu solo part at the U.S. Premiere of Sir Peter Maxwell Davie’s “Kommilitonen!” with the Juilliard Opera Production, as well as the world premiere of Jeeyoung Kim’s “Engraft” for solo erhu and string orchestra with Solisti Ensemble at Carnegie Hall. He also premiered Winnie Lan-In Yang’s “Fantasy for Erhu and Strings” with the New York Classical Players. He has been invited by the Milwaukee Symphony Orchestra and the Grant Park Symphony Orchestra of the Grant Park Music Festival in Chicago to play the solo erhu part in “Iris dévoilée” by Chen Qi-Gang. He has also been invited by the Metropolitan Museum to give recitals at their Gallery Concert Series and Patrons Lounge Concert. He has appeared at OK Mozart and Chamber Music Northwest festivals. Upcoming concerts include a viola/erhu recital at the Caramoor Center for the Music and the Arts. He currently serves as a faculty member at the Chinese Cultural Arts Institute in Harrisburg, PA.